Here in our Desert Garden you can stroll through three different levels of demonstration gardens showcasing various species of plants that can be grown in the region. There are two water features and quiet seating in this tranquil setting. A great spot to sit and relax while watching the native birds come and go. 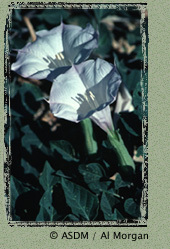 Jimson weed (its most widespread English name) is a perennial herb 2 to 5 feet (0.60-1.5 m) tall and up to several feet (a couple of meters) wide from a large tuberous root. The foliage is dark green and sticky with an unpleasant odor when crushed. Big funnelform, white flowers are 6 inches long and 3 inches wide (15 x 8 cm); they open by dusk and emit a strong, sweet fragrance. The bloom is sporadic throughout the warm months if soil moisture is present, but it flowers most heavily in late summer. The spiny, golf-ball-sized fruit contains numerous disk-shaped seeds. This beautiful plant is a useful ornamental if there is sufficient space for its large size and one is willing to put up with its winter disappearance below ground. Hawkmoths pollinate the flowers and lay eggs on the foliage. The caterpillars (called "hornworms" in this family) incorporate the plant's toxins into their own tissues and become toxic to their potential predators. Like the Spanish name, the O'odham name also means "sore eyes"; the name should be taken seriously. 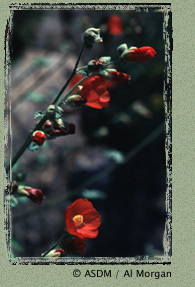 The very wet winter of 1998 produced huge fields of globemallows 5 feet (1.5 m) tall in many desert areas. On a Desert Museum expedition to Baja California we drove through a patch on a warm day with the windows down. The road was so narrow that the side mirrors slapped the mallows on both sides of the vehicle. Our resultant misery reminded us that stellate hairs probably evolved to discourage herbivores. This is a spreading shrub, usually about 2 feet (60 cm) tall and twice as wide with sparse semi-evergreen foliage of small, twice-compound, leaves. One-inch (2.5 cm) mimosoid flower heads are pale to deep pink. The plants flower profusely in late winter and sporadically at almost any season in response to good rains. Fairy duster grows from southern Arizona and southeastern California south to central Mexico and northern Baja California. 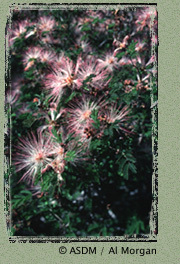 Fairy duster has several pollinators, including bees, flies, and butterflies. 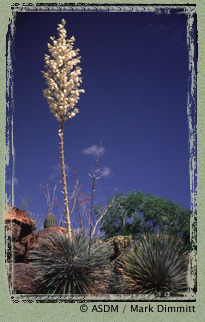 It is among the first perennials to bloom in Arizona Upland, typically in February. Desert marigold is an annual or short-lived perennial with white-wooly leaves forming a dense mound about 6 to 8 inches (15-20 cm) in diameter. Flower heads perch well above the foliage on 1 foot long (30 cm) stems. The flat 1 inch (2.5 cm) daisies are bright yellow. Desert marigold grows mostly on bajadas and in valleys throughout the northern Sonoran, southern Mohave, and northern Chihuahuan deserts. 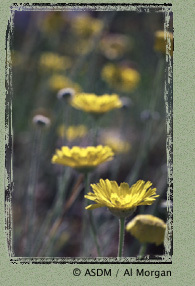 It is one of the most common wildflowers, often abundant on disturbed soils such as road shoulders. This is perhaps our most consistent showy roadside wildflower; it blooms in any season after a moderate rain. On hard soils such as caliche, desert marigold is replaced by the somewhat similar Bahia absinthifolia (which has no vernacular name except its genus name). The foliage of bahia is more sparsely distributed; its stems arise from perennial underground rhizomes that form colonies. Bahia leaves are less woolly and the flowers slightly smaller than are those of desert marigold. Bahia's range extends into pine forests. The leaves yield the major basketry fiber for the Tohono O'odham, who know how to harvest the tender new leaves in a way that promotes branching instead of killing the plant. The English common name refers to another of its uses.